Sorry, but this is probably going to be the most boring recap ever because not a whole lot happened in this episode. At least nothing particularly amusing. In this penultimate episode of Next Food Network Star season 8, we find the six remaining Wannabes still in Miami. They have one final challenge to face - filming a 30-second promo for their potential Food Network show. 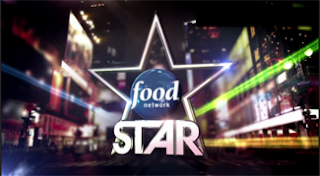 There will be three takes, three chances to get it right, before it is screened before a panel of Food Network luminaries like former FNStar winners Jeff Mauro and Melissa D'Arabian. For no good reason, they shoot each of the six promos in a tacky little green and pink wagon in the middle of a farmers' market. Each of the six contestants fucks up the first two takes, and we're to assume they get the third one down. Later, we're outside with the judging panel, Tushface, Susie, Sunny Anderson, Robert Irvine, Aaron Sanchez, Jeff, Melissa, and Anne Burrell. The Wannabes are there too, sitting with their mentors several yards behind the panel, apparently out of earshot of any snarky comments that might fly. And here's how the pink and green nightmares went down: Nikki's promo is shown first, and it's nothing special. She doesn't mess it up, but she doesn't make anyone clamor for her show, either. 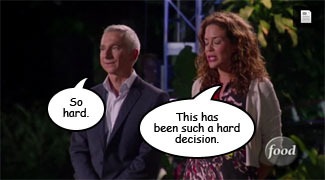 Besides, doesn't Bobby Flay already have the market cornered as far as grilling shows are concerned? Michele is "up" in her video, and her intensity and body language scares Sunny Anderson, but Robert Irvine loved her. Ippy's promo intrigues Jeff, but Sunny finds his delivery to be annoyingly "sing-song-y." Melissa loved him. 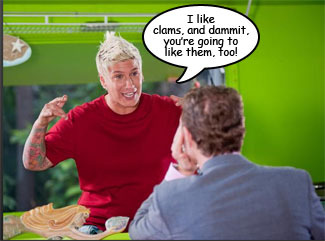 Anne Burrell found Yvan to be charming, but wasn't exactly sure of what he'd be cooking on his show. After Justin's promo, Aaron said it was clearly obvious that he had been mentored by Alton, and Sunny thought his likability was "off the charts." Anne and Susie loved Martie, but Robert wasn't sure she could deliver all she promised. The Wannabes are sent away. Tushface tells the panel that this is the "biggest elimination in FNS history." Yes, like taking a giant dump. Then the Wannabes are brought back to hear the verdict. Michele is the first to be awarded a pilot, which means Nikki goes home (yay). Yvan beats out Ippy on Team Giada, which I expected but still made me sad. And then there's a commercial break before we find out whether Justin or Martie gets to make a pilot. 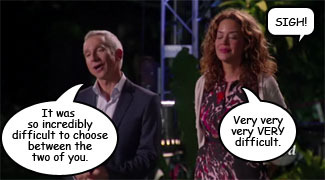 Both were pretty damn good, and Tushface and Susie insist that it was a very difficult decision. Martie is crying, Justin is getting all red-faced, and Alton looks like he's going to explode when they announce that Justin is going to make a pilot. And Martie is too. Turns out that Tushface and Susie are human after all. Next we're in New York to shoot pilots. 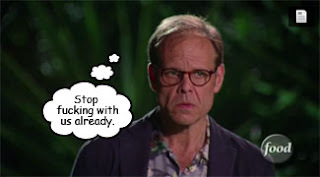 Alton suggests to Justin that they film his at his Brooklyn restaurant and that he should do a twist on a Food Network star's classic. Alton volunteers the Caesar salad from an early episode of Good Eats, and Justin's take on that is grilled romaine topped with an aspic. I know. 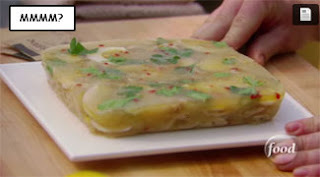 Aspic. It looks like a huge blob of snot, but if Justin says its good, um, well, it's probably good. Michele starts off her show trying clam chowder at a NY seafood eatery before going to a rooftop kitchen to make a dish of clams with corn. What's with all of the clam cookery, Michele? Trying to tell us something? Martie is hosting a fake party for her show and shows us how to make pickled shrimp. And then Yvan makes creamed corn mac and cheese for his little brother and some other family members. After another commercial break, we see all four pilots. It's clear that they were all directed by the same person - there are too many shots of moving hands and eyes focused on a different camera. Yvan's is a bit dull, a bit too much like other stuff already on the network, but the other three are terrific, particularly Justin and Martie. I can see both of them getting shows on either FN or Cooking Channel. Michele, too, for that matter. In any case, voting is open until 5pm on Tuesday, July 17th. Go to foodnetwork.com/star to vote. Next week, we find out who gets their own 10:30AM Saturday show.